Purpose of these pages is to come in contact with other collectors, all around the world, who like me are interested in LATVIAN PHILATELY. My hope is also to be able to give information about "news" from the field of research of the Latvian Philately. This mostly will be about the different postmarks from the inter war period (1918-1940) as this is my "speciality" but, if some other things will pop up about the Postal History of Imperial Russia in the Pre- Independent Latvia I will be glad to write about this too. I here have information about Provisional postmarks from the early years before the Postal Administration wasn't fully organized and also notes about the censorship markings from Soviet-Latvian period as well as from Latvian Republic period. This then follows by information about the Standard postmarks used during the whole Latvian Republic period (and also the following German period until 1945) and temporary markings used when the ordinary cancels were at the workshop for reparation or engraving. Here you also can find information about TPO's (the Travelling Post Offices - mail vans) and furthermore about the Machine cancellations. Note! You can always enlarge a picture on this web-site by clicking on it. 09 June2018 - Good News! 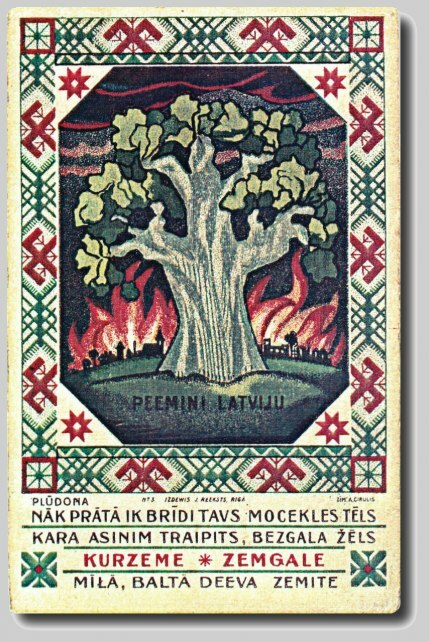 A patriotic multi-colored postcard, issued during the Latvian War of Liberation (1919-1920), depicts the mystical nine-branched oak tree of Latvian Folklore as the symbol of a nation's strength against a burning, war devastated overcome all difficulties in the pursuit for freedom. Traditional folk designs grace the borders and a patriotic verse by the Latvian poet V. Plūdonis is written at the bottom. The postcard was drawn by A. Cirulis, the designer of the 1st Latvian stamps, the "sun design" issues.